Do you think you know the cell? In high school biology classes, you learn that the cell is like a small factory, with the nucleus that directs everything, the mitochondria that provide the power, the membrane that keeps everything together and so on. However, scientists have not been able to actually look into a live cell to see how all the parts interact… until now. 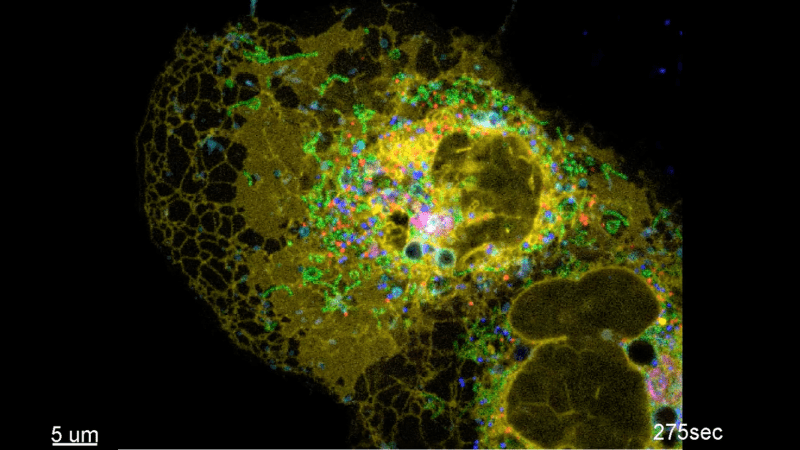 A team of American scientists used dyes to tag the organelles in a monkey fibroblast cell, which created some fantastic images and videos of what actually goes on in a cell. The different part of a cell, in colour! Lysosomes (cyan), mitochondria (green), ER (yellow), peroxisomes (red), and Golgi (magenta), and labeled with BODIPY 665/676 to stain lipids (blue). Image credits: Valm et al, 2017. What makes this study special is that it’s being done in multiple organelles (specialized structures) in a live cell, which had never been done before. Before, images had only been taken or one or two interactions between organelles shown. Little was known about how organelles are situated in a cell and how they interact. To see how the organelles interact, the researchers tagged organelles with proteins that become fluorescent when there are different colours of light. A laser scanning confocal microscope with a spectral detector was used to get images. An ultrathin light sheet was placed next to the camera lens and projected on the cell so that the cell was examined in slices, rather than all at the same time. This breakthrough prevents too much light from killing the cell. The organelles that were tagged were lysosomes, mitochondria, endoplasmic reticulum (ER), peroxisomes, and the Golgi. Lysosomes and peroxisomes break things down, acting like a digestive system for a cell. The endoplasmic reticulum creates important things for the cell, such as proteins and lipids, and the Golgi body packages them for transport around the cell. The mitochondria create the power for the cell. The researchers were also interested in seeing how lipid molecules travel in the cell so they soaked the whole cell in a dye that likes lipids. See the supplemental videos here for videos of all of the organelles interacting. A video of the cell that the research group took, see how the yellow endoplasmic reticulum touches everything. Video credits: Valm et al, 2017. Organelle numbers, speeds, positions, and interactions between organelles were mapped. Interactions between the ER and other organelles were evenly distributed throughout the cell, while other organelles mostly interacted with each other near the nucleus. Lipids are created in the endoplasm reticulum, stored in droplets for transport, undergo β-oxidation in mitochondria and peroxisomes, and are hydrolyzed and recycled in the lysosomes. When the cell is starved, the lipids make more contact with the mitochondria to release energy. The endoplasmic reticulum interacts with almost everything in the cell and is mesh-like in shape. Additionally, the mitochondria constantly move and are stacked in layers. This method is great for seeing how the cell works and how different players in the cell interact. This imaging could be used for testing drugs, pathogens, and other stressors to see exactly what effect they have on a cell. The cells could also be studied when they undergo migration and division. If the method is optimised more, it could be possible to tag even more organelles in a cell. Anyways, we now know more than ever about what goes on inside of cells — and we can see it too! Journal reference: Valm, A.M., Cohen, S., Legant, W.R., Melunis, J., Hershberg, U., Wait, E., Cohen, A.R., Davidson, M.W., Betzig, E. & Lippincott-Schwartz, J. (2017) Applying systems-level spectral imaging and analysis to reveal the organelle interactome. Nature 546, 162–167.